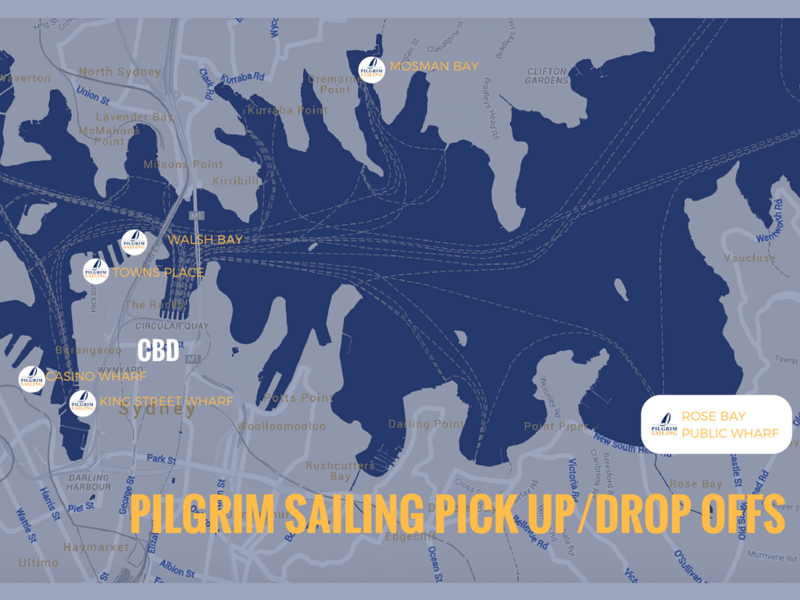 Pilgrim Sailing operates from several different wharves on Sydney Harbour for our Private Charters. We recommend Rose Bay Wharf as a pick up point as it is easy access from the city and there is parking here. However we can pick up from the wharves featured on the map below (small surcharge to cover maritime fees on these wharves). FOR MAPS AND MORE INFORMATION ON EACH LOCATION SCROLL DOWN. ​No additional charge for pick up/drop off. Parking is also available at the ferry wharf. Additional charge: $150 each way. ​King Street Wharf is in the heart of Darling Harbour, close to the Cargo Bar. There are four wharves which we can access here - 6, 7. 8 & 9. We will notify you which wharf we will be using before your charter. Additional charge: $100 each way.